I feel like I’ve been able to watch Eddie Redmayne’s career develop every step of the way. I’m sure this is erroneous, but at the very least I’ve seen a few of his benchmark films, the movies in which he’s grown into the excellent actor he is today. The first time I saw him was in Powder Blue, a mediocre stories-tied-together drama that also starred Ray Liotta, Forest Whitaker, and Jessica Biel. Redmayne stood out, with an unusual look for Hollywood and a unique presence. I didn’t think too much about him until I saw him again in Les Miserables. He played Marius, and played him well, stepping into the spotlight for the first time (well, the second time; My Week with Marilyn came out one year earlier). And now, Redmayne is a star, taking his biggest test yet, receiving Oscar buzz for a portrayal that is being called award-winning, and deservedly so. 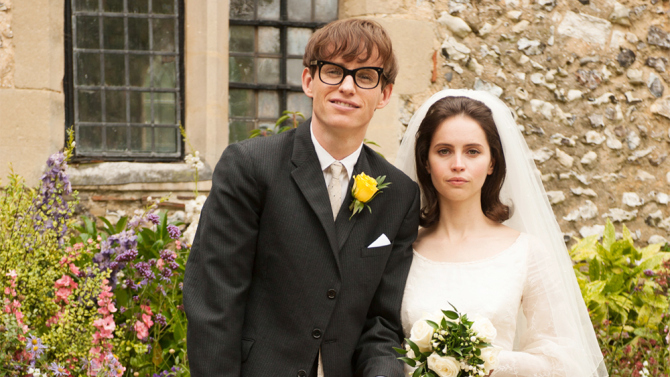 This is the true story of the life of Stephen Hawking, as seen through the eyes of his wife Jane. It begins with Stephen as a young physicist, attempting to get his doctorate at university in England. There was no doubt that Hawking was brilliant, but his laziness & distractibility kept him from developing a thesis and putting his great mind to work. Two significant events kept Hawking’s attention away from school as well. The first was Jane, a beautiful art student met at a party, a woman who would become Stephen’s wife, constant companion, and ultimately his caretaker. For the second event was a tragic one; the revelation that Stephen had motor neurone disease, also known as ALS or Lou Gehrig’s disease. Life expectancy was two years, but with the help of his brave wife, Hawking not only outlived his prognosis, but went on to become the most famous physicist of our time. First of all, what an amazing persona to base a film on. What an incredibly fascinating story of a man who was not only a genius, but a genius bound to a wheelchair and unable to speak. Stephen Hawking is a phenomenal figure, a scientist who understands the universe better than any of us, and yet has such limited means to communicate that information. The wonderful part about this story is that he finds a way against all odds, not only a way to survive but also a way to write books, challenge theories, develop new ideas, and basically teach us all about the amazing world around us. Hawking spent much of his life unable to move, speaking through a computerized voice box, writing novels one word at a time using only his index finger. This is an unbelievably courageous and impressive true story, one that takes us through all the years of trial, through the setbacks & successes that make the life of Stephen Hawking so unique. 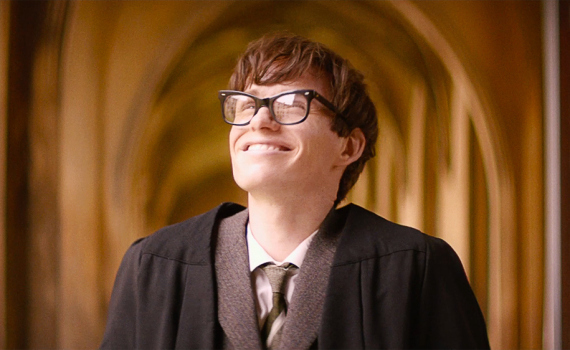 Redmayne was excellent as Hawking, deserving all the praise he’s received for his perfect portrayal. He transforms from the young, goofy, fun-loving college genius into a man who won’t be held down by his limitations, although they are many. Redmayne does a lot with very little, having to speak with basically only his eyebrows towards the end of the film, communicating with barely a movement. 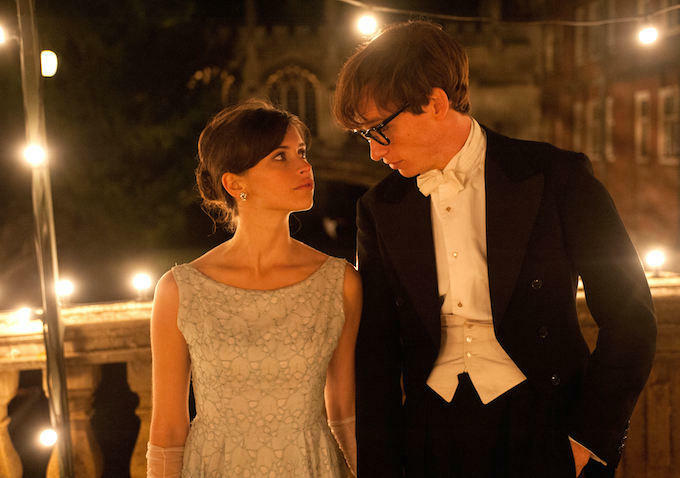 He became the character in a way that made me forget the Hollywood process, drawing me into the world of Stephen Hawking with seamless effort. Felicity Jones was also strong, playing Jane with what began as weak tenderness and turned into a strength that could teach us all a lesson. The story was more about Jane that I had imagined it would be, detailing her struggles to raise a family, to remain a woman, not just a nurse. There were heartbreaking moments, great triumphs, bitter defeats, and ultimately love, as cheesy as that sounds. This is a movie that can sweep you up if you let it, that can become something more than a biopic, perhaps even more than Oscar-winning film.